Bitcoin Private (BTCP) is an open-source, peer-to-peer cryptocurrency with the optional ability to keep the sender, receiver, and amount private in a given transaction. This is in contrast to many cryptocurrencies such as Bitcoin, which have a fully transparent transaction history. 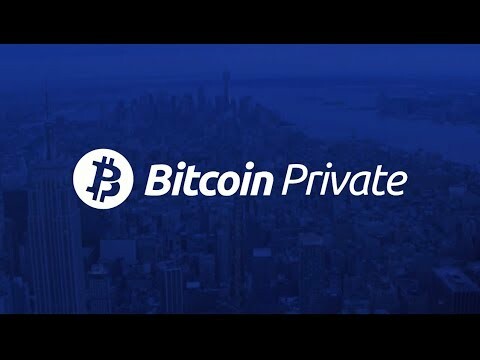 Bitcoin Private is a cryptocurrency forked from both Bitcoin and ZClassic cryptocurrencies with a focus on private transactions. The symbol for the Bitcoin private coin is BTCP, which will be distributed based on a snapshot of BTC and ZCL holders on February 28, 2018. BTC and ZCL holders are credited BTCP on a 1:1 ratio based on this snapshot. Bitcoin Private gives users the option to generate either public or private addresses, redeemable for transactions to either address type. Private addresses work by using use Zero-Knowledge Succinct Non-Interactive Arguments of Knowledge (zk-SNARKs), as opposed to the older technique of ring signatures used in coins such as Monero. Evidence of ownership is provided without revealing which units are owned. This means that owners can redeem funds without any traceable history. Bitcoin Private retained Zclassic's Equihash algorithm. Equihash is a memory-intensive proof of work mechanism, making it ASIC-resistant. This reduces centralization by incentivizing mining with accessible hardware. Bitcoin Gold also borrowed Equihash from Zcash. Despite this, a study in May 2018 found that 30% of total hashes were coming from ASICs. Bitcoin Private is a merge fork of Bitcoin and Zclassic. Zclassic is a fork of Zcash, an implementation of the Zerocash whitepaper. Zclassic was released in November 2016, by blockchain developer Rhett Creighton. Creighton used the same code as Zcash, with a lack of a founders fee required to mine a valid block. This promotes a fair distribution, preventing centralized coin ownership and control. In December 2017, Creighton announced that he would be restarting Zclassic development after months of inactivity. The Zclassic team announced interest in creating a private Bitcoin fork days later. Bitcoin Private's fork snapshot occurred on 28 February 2018, and the main net was launched 3 days later. It was subject to a 51 percent attack on 13 October 2018. Zclassic is a private, decentralized and community-driven coin built primarily to provide privacy and selective transparency of transactions.